I’ve been trying to write this post for weeks. This probably sums up parenthood or at least life with a newborn pretty accurately. You have good intentions: you make plans, get excited about said plans, and then? Baby has other plans. Your plans go out the window. Fixin’ to eat dinner at 6? Think again. Dinner’s at 9 and it’s cold stir-fry eaten standing up in the kitchen, staring off into space with a side of cheez-its because you forgot to eat lunch today (again) and you’re still hungry. Want to go for a family walk with your dog and try out your new stroller? Once you’ve set everyone and everything up, baby will have an epic spit up and you’ll be back in house cleaning baby and the stroller and before you know it, it’s dark out and the opportunity to walk has passed. Other parents I knew warned me through sly smiles that I, the perpetual planner, was about to get a reality check once baby showed up. In fact, I’m about to get interrupted by my crying little buddy so hold that thought. Life lately is a pattern of feed, change, play and snuggle baby to sleep on repeat, then squeezing in chores and emails and texts and showers and eating (and mindlessly checking Instagram—note to self: cut back on that) while Jack naps, which can be anywhere from 20 minutes to three hours long. All the while, time passes. Hours melt into days and days into weeks and suddenly it’s been a month and my baby boy has grown and changed before my eyes. Tiny Jack who used to fit into newborn onesies and sleep all.the.time is now wearing three month onesies (at one month old?!) and is awake and lucid for much longer stretches. I can’t wait until he gives us his first social smile, until he crawls for the first time, until says his first words and yet I want time to sloooow down because sooner or later I’ll have to go back to work. Honestly, I’m dreading it. Maternity leave has been such a gift, and I’m savoring every moment I can, grateful to bond with my son mornings and afternoons when I’d typically be at the office. There is nothing quite like holding Jack tight and breathing in his baby smell while rocking him to sleep in his room. It feels like a tiny bit of heaven on earth. To my parent friends: You were right, of course. My best laid plans are often undone by my son’s “plans.” I did get my reality check but I’m surprisingly OK with it. Motherhood has helped soften my rigid desire for order and allowed me to embrace chaos. 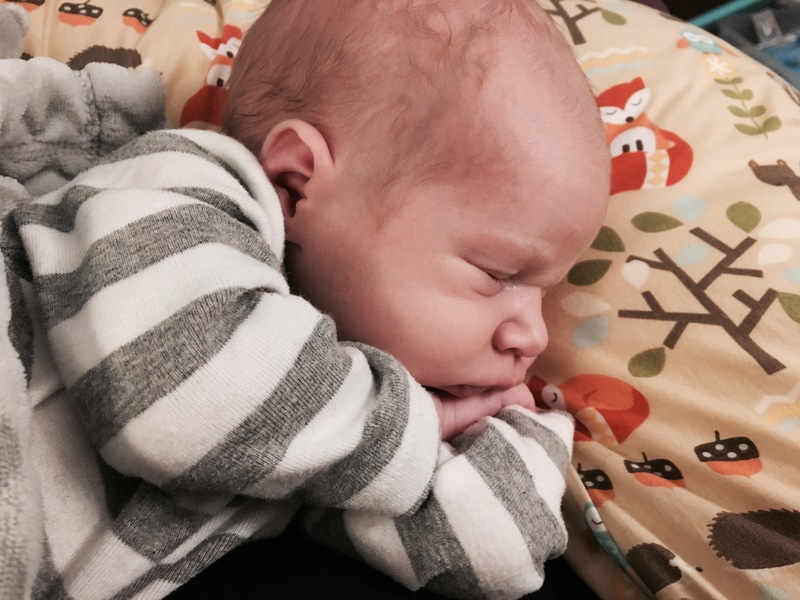 The chaos didn’t surprise me—because you warned me about it—but there were plenty of other things that did surprise me about parenting a newborn, perhaps the biggest being the incredible range of emotions I’ve felt since giving birth to Jack. A pastor friend of mine once told me that once you have children all your highs are higher and your lows are lower. Hey Pastor Hardy—you were right. I get it now. Not only am I more emotional due to hormones, but the fierce, mama bear love I have for my son is unlike anything I’ve ever experienced. Also I get frustrated a lot more than I once did, sometimes for no particular reason, just EVERYTHING because being a parent is so damn hard. I get sad too, really sad. Sometimes I cry for no particular reason, or when I remember Jack’s birthday, which was terrifying and traumatic and nothing short of an act of God. The first night Jack slept at home, actually the first few nights, I “slept” next to his crib, on the floor, waking up every few minutes to check if he was still breathing. I think I finally wore myself out enough to fall asleep only to be woken up by his hunger cries. I was so exhausted but so relieved he was alive I ran on adrenaline those first few days. My heart was so full of gratitude that my baby boy was safe at home with us. Jen Hatmaker has a lovely blog about parenting, “I wish someone would have warned me about these BIG FEELINGS,” that I read hungrily and eagerly at the start of motherhood journey thanks to a tip from a fellow mama. Me too, sister. Me too. Those BIG FEELINGS? Yes, that’s exactly what surprised me the most about becoming a mother. There have been, of course, other parenting surprises, both delightful and distressing, along the way. I wonder if my child will grow up safely and think of all the possible ways he could die and desperately wish I could stop worrying because that’s what my mom used to do (Mom, I get it now!) and that also gives me major anxiety. I’m falling in love with my husband over and over again as I watch him parent our son. But *the most* delightful surprise about motherhood, for sure, is how much love is in my heart, in my home, right now. Being a mother is the most challenging thing I’ve ever done, and it’s also the most rewarding. I’m incredibly grateful for the privilege. Fellow parents/caretakers out there: What surprised you most about parenthood when you first brought baby home? I’d love to hear about your experiences!